The bill aims to use existing resources to fund a new account that will provide wage replacement benefits to eligible firefighters who suffer from certain types of cancer. 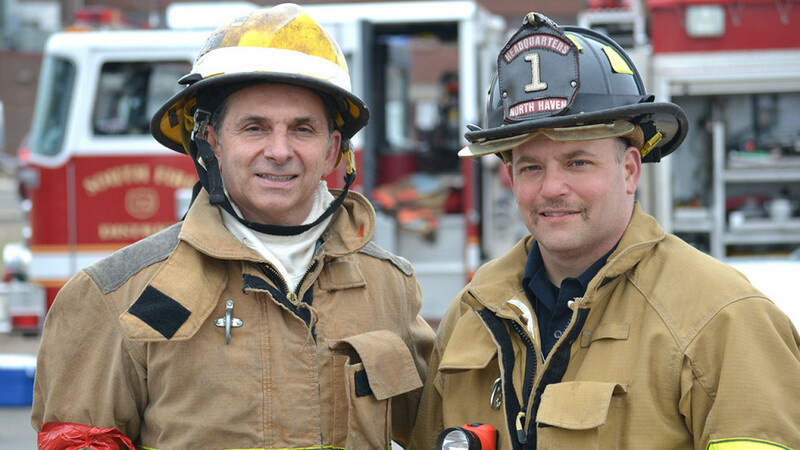 State Representative Dave Yaccarino (R-North Haven) and North Haven Firefighter Anthony DeSimone. State Rep. Dave Yaccarino (R-North Haven) praised the passage of an initiative to meet the needs of firefighters, which have contracted certain cancer related to their on-the-job duties. The bill aims to use existing resources to fund a new account that will provide wage replacement benefits to eligible firefighters who suffer from certain types of cancer. The bill also establishes certain uniform safety and reporting measures to help protect firefighters. “I am proud of this bipartisan effort to help our local firefighters. These courageous individuals brave dangerous working conditions on a daily basis and even risk their lives to protect ours, so it is only right that we tend to their medical needs, especially those acquired due to on-the-job duties,” said Rep. Dave Yaccarino. The bill diverts $.01 (cent) from the current e911 fee on phone bills and directs those funds to a new ‘Firefighters Cancer Relief Account’. The account will be managed by the Connecticut State Firefighters Association through a new Cancer Relief Subcommittee. According to the legislation, the account funds are to be used solely for the purposes of providing wage replacement benefits to eligible firefighter cancer victims and to pay administrative costs. The benefits do not begin until July 1st 2019, permitting the account sufficient time to accumulate funds and the benefits can only continue for up to 2 years and payments are limited to what is actually in the fund. Firefighters Cancer Relief Program would be available to the uniformed members of paid municipal, state, or volunteer fire department, local fire marshal, deputy fire marshals, fire investigators and fire inspectors. The Firefighters Cancer Relief Program, under the new law, would provide the wage replacement benefits, for eligible firefighter cancer victims. The bill now heads to the state Senate for a full debate and vote; from there the bill will head to the governor.